Personally, I find that Firefox is the #1 memory hog on my system, so I'm tempted to install several different instances, each with just a few add-ons, and switch between them. If PowerPoint or Keynote aren't lively enough for your presentations, why not run a live demo from a browser instead? You can drive home that what you're talking about actually exists, you can pull in information from other sources rather than showing a single screenshot or brief excerpt. Whatever is the main page of your demo/presentation, set up as many ways as you can to get back there quickly. Make it your home page, just until the presentation is over. Make it a "quick link" on the browser bookmark bar. When you're 10-20 seconds from the end of your spiel on one page, close it and open the next link. Wrap up that discussion, with the audience focus on your voice rather than the screen image, while the next page loads. When you're whipping up the text of your presentation, the key point is to get it out fast. Presentation software is good for flowing text into templates with headings, paragraphs, and list bullets. To get the same kind of efficiency for text you'll slap on a web page, you can use Markdown, a text-to-HTML converter that lets you write in wiki-like style (start a line with a * to make it a bullet point, and so on). You may be familiar with the keyboard shortcuts Cmd-Shift-3 and Cmd-Shift-4 to do screen captures in OS X. The "3" shortcut takes a picture of the whole screen. The "4" shortcut lets you drag an area to capture. By default, the screen captures are stored in your Desktop folder. Adding the Ctrl key to the key sequence puts the result on the clipboard. But what if you want to store the pictures somewhere else? In the UNIX shell, you could use the alias command to run screencapture with a preselected set of options. But that still forces you to specify the full path to the file on the command line, or switch to the directory where you want the file stored. A more convenient technique is to use shell functions, which let you pass parameters. For example, here I create 2 commands I can use to take screen captures. blogsnap foo puts the output in foo.jpg in a predefined folder. clipsnap sends the output straight to the clipboard. mailsnap sends the output straight into a new mail message. You can paste the commands below straight into a terminal window to define those commands temporarily, or put them into the shell initialization file (depending on the shell, typically .profile, .bashrc, or .kshrc) so that they're available in each new Terminal window. This is one of those features that everyone has daydreamed about when getting short-distance directions in Google Maps. You get some convoluted route with loops and hairpin turns based on one-way streets and divided roads, when all you really wanted was to walk from your hotel to a restaurant a couple of blocks away. Now you can, with walking directions in Google Maps. When I spilled some water on my desk, I thought I had whisked the iPod to safety in time, but the next day I noticed telltale droplets on the bottom surface and it wouldn't turn on or charge. I Googled various combinations of "ipod water damage", and the gist of the suggestions was to keep the iPod turned off while letting it dry (under gentle sun where possible) for up to a week. I had already made some attempts to turn it on, which may have sealed its doom. I haven't been able to get a peep out of it after several days. All the advice seemed to be for a disk-based model, and I have a flash-based Nano; don't know if the all-memory models are more susceptible to damage this way. - 3 CDs worth of music. - Music CDs burned at random from one of my favorite playlists, suitable for driving. - Music CDs not labelled at all, so I can swap 3 in randomly from a bigger selection, and have no idea what will come up. - Podcasts carefully labelled (title and episode number), so I can fill up slots 4, 5, and 6 and keep track when wrapping around. E.g. sometimes I put the next 2 episodes in CD slots 4 and 5, before I've listened to the earlier episode that's still in slot 6. The downside of podcasts on music CDs is that one episode takes a whole CD, assuming it's reasonably long, regardless of the bit rate / sound quality. What lessons can we learn from the physical world that also apply to the higher realms of the mind and the spirit? The old quote "eyes on the prize" is actually very practical advice! It occurred to me that lately I've been biking, playing tennis, and discussing golf if not actually playing. And each of these activities has some variation of that same "eyes on the prize" lesson. Tennis in particular has the idiom "keep your eye on the ball", repeated so often perhaps people stopped thinking about what it really means. The most accurate tennis shot comes when you keep your head still as you make contact with the ball. The natural impulse is to pull your eyes and attention away a moment before contact, swivelling your head so that you can follow your own shot and see where it lands. But that motion can result in a shot that's off-center or that goes off-target. Now, a tennis match involves hundreds or thousands of shots, but the outcome hinges on maybe a dozen or two critical moments. The more important the shot, the more temptation there is to be distracted, the more important it is to focus on this lesson at that moment. If your opponent is at the net and you must hit a precise passing shot, or you have a seemingly easy put-away close to the net, that's the time to keep your head very still and your attention focused on the ball as you hit it. Even for a moment after you hit it, since you'll either win the point or not based on how well you execute. In tennis, experience means being able to visualize the whole court, pick a target, and hit that target without looking at it, while looking at the ball instead. You'll hear this same advice applied to the serve; look at the other side and decide on a target, then concentrate on the ball while executing the service motion. Like magic, the ball will seek the target more accurately than if you peek at the other side partway through the swing. Cycling has different considerations, but along the same lines. You might have noticed, if you spot something dangerous in the road and fixate on it (a rut, a pebble, a bump, a gate), you are likely to ride straight at it despite a fervent desire to avoid it. Muscle memory doesn't know how to interpret a negative directive, "don't go there". You have to turn the impulse into something positive -- focus on some area away from the danger zone and steer towards it. Depending on how treacherous and steep your path is, you either focus on what's immediately in front of you (avoid this obstacle, reach that next milestone), or you let your imagination wander farther ahead to your ultimate goal (the finish line, home sweet home). Golf offers a third variation on the same theme. As in tennis, you perform the same precise movement over and over. As in cycling, you are going for a positive goal that's a long way off, but it's important to avoid obstacles along the way (the trees, the water, the wrong fairway). During the golf swing, again you should keep your head still and focus on the spot where the ball is, even for a moment after you've actually hit it. The golf course is big enough, and usually unfamiliar enough, that you can't visualize an entire hole the way a tennis player pictures the court. But you can form a mental image of an intermediate target, something that if you can fly the ball over it probably means you're on-target. You want that target to be something positive (the green on the other side of the water hazard) rather than a negative obstacle (the tangled brush where you'll never find the ball). The lessons for life almost write themselves. Focus on the positive steps you're taking towards your goals and to avoid potential problems, rather than fretting about the dangers themselves. Keep executing until success is ensured; don't look away too soon (the old "counting your chickens before they've hatched"). Concentrate on the things you can control (the ball), don't be distracted by your opponents or the hazards along the way. Gain experience and think ahead, so that you can either visualize your whole plan, or (if the whole system is too big or complicated) pick the right intermediate target to know you're on the right path. I've just started downloading and reading up on the recently announced iPhone SDK. The Apple development environment, Objective-C and all those frameworks, has never quite appealed enough to me to dive into them. Using those same things for iPhone apps could be the tipping point for me. Looks like quite a nice set of sample applications to use for a starting point. And FAQs and tutorials available the first day. That's a good sign for me. People have thought through use cases, likely questions, and getting-started scenarios. Too often, good technology is bogged down in technology for its own sake, or installation/startup problems are assumed to be handwaved away. I'm a bit saddened that Palm didn't entice me with this kind of stuff several years ago when I tinkered with Palm programming. (I have a blog post in the back of my head entitled "Why Palm Didn't Take Over the World" that deals with that notion.) With all the emphasis on rewriting Palm OS using Linux and what have you, I never saw a push for things that I felt would yield a lot of bang for the buck. Enhancements to the PC-based client software -- the Windows version never changed much, and the moribund OS X version is so limited and painful I've stopped doing any entry or synching on OS X. (With the iPhone, is there any doubt that iTunes will keep gaining more and more capabilities? Already, the iPhone demos are supplied as movie downloads through the iTunes store.) Pushing the platform to its limits -- does it really take a complete Y2K-style rewrite to, let's say, allow to-do records to have more than one category, or 256 categories instead of 16, or some combination? The thing that continues to hold me back me a bit, looking at the sample material, is what I think of as "frameworkitis". For every conceivable thing you might want to do, there's a different method with a long name. Just memorize a few hundred of those and you're off to the races. For learning any large system, there's a balance between the number of things to learn at the first, second, third, and sometimes fourth levels. When I evaluate the usability of any development environment, I look at whether too many things (class or procedure names) are pushed up to the top level, or whether you can learn a small number of general things, and then branch off to other things that follow logically. Let's break out that simulator and see how the iPhone APIs fit into that view of the world! Everyone fills in the basic facts in iTunes for their songs -- name, artist, and usually album -- but don't forget another valuable piece of information, the track number! Track number is important when you're burning an audio CD. You'll want to sort by that field to avoid the songs coming out in alphabetical or some other unhelpful order. It's important when you want to verify that you have all the tracks from an album. When listening to the album in iTunes, you can sort the songs and turn off Shuffle to re-create the album experience. Ditto on your iPod, if you turn off Shuffle or set it to Shuffle Albums, and listen to songs in album order. If a group of songs don't already have the Track Number field filled in, don't give up hope. A couple of Applescripts let Mac users of iTunes fill it in without a lot of gruntwork. 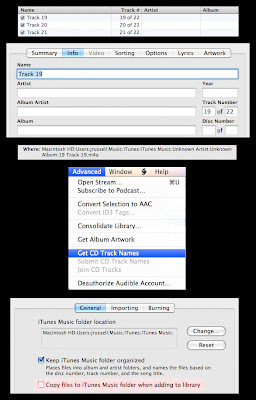 Use the first script if your song names in iTunes are stuffed with several pieces of information, including the track number. Typically, all the songs from an album will use the same format for the name, for example "01 - Happy Birthday - Greatest Birthday Songs" or "5. Christmas Album / Jingle Bells". But each album might use a different format. That's where the Track Parser script comes in. You select some tracks, enter a coded string that says how to interpret the data, spaces, and punctuation in the names. The script scans through the selected tracks and slots the information into the right fields, while stripping that extra information out of the name field. You can experiment by doing "test runs" on a single track before you turn it loose on dozens of songs. And you can save the string patterns, so that if you encounter similarly named songs in the future, you can "decode" them just by picking from a list of sample song names. If the track information isn't in the song names, all is not lost. You'll just need to do a bit more work. First, you'll need to download and install the Albumize Selection script. Go to Wikipedia, Amazon.com, or some other "discography" site that lists all the tracks on that album. Turn off Shuffle in iTunes, put the tracks in a playlist, and sort that playlist by the first column -- the one with no label, just numbers. That puts the tracks in the order that is iTunes' "best guess" of the right order. Once these settings are in effect in the playlist, you can drag songs up and down to reorder them. 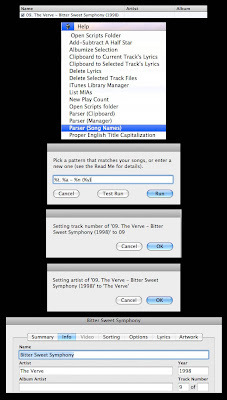 When they're in the right order, select all the tracks from the album (or from disc N in a multi-disk set), run the Albumize Selection script from the iTunes script menu, and it will fill in the "Track X of Y" information for the selected songs. If you have to go to these lengths to find out album information, don't forget to also fill in the year for all the songs in each album. That will let you create Smart Playlists based on year or decade, and sort an artist's work in chronological order. "This is like the whitest place ever. Nobody's gonna shoot us!" -- Girl hanging out in front of elementary school. I have a love/hate relationship with my Canon S3 IS when it comes to shooting action scenes like sports. Well, actually, more like hate-hate-hate-(repeat for 2 years)-like-like-sorta-love. The S3 IS sports a 12x zoom, which after all the crop factors and sensor sizes are said and done, gives essentially the same maximum magnification as my Canon 20D with a 70-300mm zoom lens. (I've shot identical pictures with both cameras from a tripod to verify.) However, the S3 IS is hampered by its electronic viewfinder and higher noise at high ISO settings, so it's only recently that I've started using it successfully for action scenes. At local pro tennis tournaments, the ushers come down like a ton of bricks on anything that looks like an SLR or big zoom lens, so the S3 with its barely extended lens is perfect for flying under the radar. That 12x zoom, with such a small light body, makes it very hard to hold the camera steady and track any kind of moving subject. Like I said, it took about 2 years before I was able to track a distant flying bird, or athletes moving around a field. Even just a small turn of the body would put the subject off the screen, and the slow refresh rate of the EVF or the LCD screen meant I would overshoot trying to find it again. With an ultra-zoom camera, you have to tone down your reflexes to move or turn the camera by much smaller amounts than seems natural. Also, it's helpful to develop the technique of zooming out until you can see the subject (even as only a small dot), then zooming in while holding steady on that subject. For an indoor sporting event, it's a challenge to shoot with available light. I choose from a few techniques here, depending on exactly how much light there is. As a first step, I ratchet up the ISO setting with the mode dial on "P", and take note of the exposure chosen by the camera when I half-press the shutter. I look for a setting between 1/60-1/125, ideally getting it with an ISO setting of 400 max. If the shutter speed is even faster, like 1/200 or better, I'll reduce the ISO speed as far as possible while keeping in the desired range of shutter speeds. Each step in ISO setting typically changes the shutter speed by 2x, so it's easy to predict what will happen when selecting a higher or lower ISO setting. If the camera is picking 1/50 of a second at ISO 200, chances are it will pick 1/100 of a second at ISO 400. If there is some combination that produces acceptable results at a decent ISO setting, I'll set the mode dial to "Av" for Aperture priority, then bump the aperture value as low as it will go, typically to 3.5 at minimum zoom, down to maybe 5.6 at maximum zoom. Keeping the aperture value small makes the camera select the fastest shutter speed that it thinks is reasonable, and makes the camera more responsive to the shutter button because it has fewer choices to make when you press the button. If the camera can't quite do what you want, that is, you can't get a good picture without going to ISO 800, then consider zooming out somewhat until you can lower the aperture setting a bit. The minimum aperture depends on the zoom level, so the camera can get a brighter picture (and faster shutter speed) if you aren't zoomed in all the way. Sometimes, cropping the picture a bit is preferable to a closeup shot that is too grainy or blurry to be useful. Another consideration is, how close to get to the action. If you are within about 30 metres of the subject, the camera needs a little time trying to focus for each shot. Even if you are farther away, it might try to focus as you lose track of the subject, or something intrudes on the foreground or background. For sports, I find the fastest response when I get far enough away to set the camera on manual focus at infinity, and then just leave it on that setting for all the shots. The same applies to distant wildlife. Another way to speed up responsiveness is to turn off the "review" setting, which brings up the image for a few seconds after each picture is taken. If you want to snap multiple shots in quick succession (as opposed to continuous shooting where you just hold down the shutter button), you'll have to half-press the button to get rid of the review image, recompose the shot in the viewfinder, then complete the shutter press. Very difficult to do with a moving subject. Set the camera on continuous shooting mode, but also turn off the review feature. Wait for a lull in the action to go back and delete any that didn't turn out. When composing a sports picture with an ultra-zoom, plan ahead to minimize the amount of panning and tracking, because the EVF/LCD just aren't very good for that. For example, at a tennis match, compose the shot leaving room for the player to move forward as they serve, so that you can hold the camera steady and just press the shutter at the right moment. In the same way, zoom out far enough that you can get a large area of the court in your field of view, rather than swivelling the camera as the player runs back and forth. In a doubles match, you might keep the camera locked on the area up by the net, to capture exciting volleys. With the camera covering a large enough are of the court, you can forget about the EVF and LCD altogether, just watching the action as normal and firing the shutter without looking at the camera at all. One last tip, this one a bit specialized. The Canon S3 IS has a special "wide-angle" mode that essentially just crops off the top and bottom of the frame, so the picture becomes a panorama, even though the resolution isn't any different than just taking a normal picture and doing the cropping yourself. I've rarely felt the need to use this mode in day-to-day shooting. It's one of the choices for the "Size" button, alongside Small, Medium, and Large. For sports, surprisingly, I do find some uses for the wide setting. Shooting a tennis match, I noticed every picture had a large area at the top showing nothing but the crowd in the stands. With the panoramic setting, I could focus in on just the court. From a practical point of view, taking a picture of a smaller area makes it easier for the camera to measure the exposure for the important part of the picture, and probably makes the camera more responsive because it's processing and saving fewer pixels. (Although I haven't measured the precise speedup.) Also, if space on the memory card or the computer is an issue, each picture shot this way is smaller than a full-size photo. Some thoughts from me on "The Wire", widely acclaimed as the best show in TV history, now entering its final season. Personally, I would vote for "Barney Miller" as #1, but "The Wire" is closing the gap fast. When I want some insightful analysis, I turn to the blog of Tim Goodman, TV critic for the San Francisco Chronicle. This season with the newspaper subplot seems to be starting off a little slow for me. But then, I thought that the school subplot was heading in a predictable direction last season, but then it went in surprising and very effective directions. The theme I saw emerging in the latest episode, "Transitions", was one of advice offered but not taken, leading to complications for the younger generation and peril for the authority figures giving the advice. Marlo clearly didn't take Prop Joe's offer to step aside. Scott the reporter is blowing off the cautionary advice from his editor. Burrell did a kind of passive-aggressive ignoring of Nerece's advice to bow out quietly, putting on a public face but still handing over the incriminating folder on Daniels. In just a momentary scene, Michael distances himself from his dysfunctional mother. The cop who goes psycho doesn't take Carver's advice on how to deal with Internal Affairs. Wow, that's a lot of parallel action. The other show that excels at that style of narrative is "Rescue Me". Notice on that show, you don't have one character having marital problems, a drinking problem, or caring for elderly parents, you've often got two or three of them going the same way. Then sometimes the situations resolve the same way, sometimes the outcomes are complete opposites. Tim Goodman mentions that this last season of "The Wire" seems to be rushing to tie up loose ends with the story arcs for different characters. The archetype for this tactic on HBO must be "Oz", which shares lineage with both "The Sopranos" and "The Wire". (The creators of "Oz" and "The Sopranos" are pals; many actors from "Oz" moved over to "The Wire", for example Lance Reddick and Reg Cathey.) The final season of "Oz" was hugely entertaining precisely because the plot twists zoomed by at breakneck speed, so each character could get their comeuppance or redemption. At that point, I said to myself, Microsoft has got to have these guys. It's perfect synergy. Google is all right as a search engine, I guess, but one obvious feature is lacking: a Scrabble mode! However, Google will happily give you definitions for abbreviations and acronyms that aren't in the Scrabble dictionary. AO is the country code for Angola. EXO and EXA are prefixes that mean things. No good for Scrabulous. So, how about it Google? If you can give me "personalized" search results, surely you can put a checkbox somewhere to only show definition links for real Scrabble words! I was also impressed at Tsonga's crafty approaches, again taking a cue from Fred Thompson by coming in later than anybody else would. Nadal has his options worked out in advance when someone hits an obvious approach shot and rushes in behind it. Tsonga paused just long enough for Rafa to decide on a safe high defensive shot, then closed for winning volley. Tennis is like rock climbing in that the best strategies often require less physical effort than you would think. In rock climbing, you keep reminding yourself to just hang there with muscles relaxed when you're not actively pushing higher. In tennis, you should remind yourself periodically that the racquet and the ball each just weigh a couple of ounces, you should never feel like you're straining to swing hard. To get a power boost on groundstrokes, start swinging a little before you normally would, accelerate gradually but steadily, and keep the followthrough going until the swing stops by itself. It's when you tense the opposing muscles, either in anticipation of a sudden impact or to stop the swing suddenly, that each stroke feels like a major effort. Keep things loose, and your opponent's hardest shot feels like a feather coming off your strings. For a faster serve, visualize yourself using 75% effort. Making yourself relax a little can (paradoxically) produce more power than straining trying to fire away at 100%. I also like to minimize the exertion while waiting to receive serve. Some amount of rocking, flexing the knees, or going up on the toes can keep you ready to move in any direction, but the motion should always be slight enough to feel effortless. Otherwise, you'll tire yourself out in long matches or lengthy receiving games. One last tip along these lines. You've probably heard advice to support the racquet with your opposite hand. That's not just to keep everything lined up at a sensible angle. Use the opposite hand to take the weight of the racquet between points; even drop your racquet hand occasionally and support thcquet at the throat with your other hand. That can make a big difference in whose shoulder or wrist cramps up in the third set! I was telling someone about this blog over lunch, when they asked whether I posted restaurant reviews. I've never gotten into Yelp or other sites that take ownership of user-written reviews, so why not post some of my own here? Good idea. Let's start with 900 Grayson, a breakfast and lunch place just inside the Berkeley border with Emeryville. We went there today while running some errands in the area. It's on 6th, a couple of blocks north of Ashby. On an earlier visit, we were perturbed by how loud the place was; everyone was carrying on a full-volume conversation that never let up from the moment they sat down. Also the staff was inattentive, which was a common theme in the Yelp reviews. But the food was OK, and most breakfast/lunch/brunch places have some strike against them, so they stayed on the list for a followup visit. Again, loud loud loud inside. This time the staff was very polite and attentive -- clearly management has read the reviews of the service. But today the food was markedly vegetarian-unfriendly. Four sandiches on the menu, including "panini of the day", and nothing meatless. A dish combined seitan and waffles -- clearly intended to be the single vegetarian entree -- but eggs feaured too prominently so I passed. I'm not a vegan, but dishes that are heavy on egg don't agree with me, and I notice when otherwise vegetarian-friendly places go overboard with cheese and eggs. Nice soup with a smoky pepper flavour. A nicely presented salad with pear, spinach, cashews and cranberries, but (a) not enough to be filling, and (b) hardly any pear or any noticeable flavour. The herb fries are always good, but when trying to make a meal out of the sides, I can't help but notice how pricey they are. The sandwiches all come with fries, but again, no vegetarian sandwiches today. So, although I don't own any copyright on the whole "thumbs" deal, if I did, I would reluctantly have to point mine down. OK to pop in for fries and soup and maybe dessert if in the neighbourhood, but not for a substantial meal. I deduct points but still enjoy fancy dinner places like Lalimes that have a similar-themed menu -- natural beef this, prawn that -- yet 900 Grayson falls short for me on vegetarian/vegan-friendly dishes. Coincidentally, the SF Chronicle just interviewed author Michael Pollan over lunch at this same restaurant. Quick, what's the most boring thing you could possibly photograph during a trip? A sign? Right! Now I will tell you... why you should photograph lots of signs. Even if you never include any signs in your photo slideshows, just having the pictures as you're sorting through them helps you remember exactly where you were for a sequence of shots. Maybe you did several trails and scenic overlooks on the same trip, and it's useful to know which pictures are from which spot. For famous locales, you might even assign keywords using the tags feature of Photoshop or other photo management software. Be scrupulous in starting every trip segment with a shot of the relevant sign, and you can quickly select a bunch of thumbnails and assign them all the same tag. When you are doing a slideshow, a quick shot of a sign can help to serve as an establishing shot for the photos that follow. You can skip over it quickly, with just a few words in case the name isn't familiar. It adds more impact than if you just say "next we did the such-and-such trail" -- your viewers will see how long the trail is, the elevation of the peak you're climbing, how antique and ornate the street sign is, and so on. Our recent trip to The Grand Canyon, Bryce National Park, and Zion National Park really illustrated this point for me. My wife diligently took a picture of the sign at every landmark. I figured, why use up several megabytes on the memory card of my expensive DSLR for a picture of a flat board with some lettering? After all, my wife is getting it in case we need it in a slideshow. Well, now sorting at home through a few thousand pictures, I really wish I had taken some reminders of which pictures are from Rainbow Point and which from Fairyland Point. Or when we did the Queen's Garden trail, did we do the Wall Street branch or Thor's Hammer? Trying to cross-reference mine and my wife's pictures would be a pain -- the clocks on our cameras are a few minutes apart, and we only adjusted one of them for the right time zone, so combining them and doing "sort by date" wouldn't work well. For a long or far-ranging trip, go into the settings menus and make sure all cameras have identical times to the minute, and are all on the same time zone. A little skill with the camera menus will also help with memory card anxiety. Practice switching to a lower resolution to shoot the sign (which after all, you're not going to blow up into a poster-sized print), then back to high resolution, RAW+JPEG, or what have you for the other pictures. OK, trail signs, road signs, what other sign-like things can we think of to shoot? Take pictures of informative signs about plants, wildlife, and geology. You might use 'em to identify flora, fauna, and landmarks from other pictures. If the sign is too wide and your camera resolution isn't high enough, take separate right and left shots so that you can read the text when you view the picture. If you have a memorable meal in a restaurant, take pictures of the relevant menu pages. (You can take the menu away with you and do this at home or at your lodging later.) You'll have a reminder of what to recommend to others, or what wine you really liked. Sometimes taking a picture of a map display, or a printed map, comes in handy later. I've had situations with 2 people and 1 map, the people need to separate, and the mapless person has a picture for safety. Zoom way in and scroll around in review mode if you need to consult the map on the trail or on the road. One last tip on this subject. Sometimes I'll want to know at what point I changed some camera setting, such as white balance or ISO. I might want to evaluate how well the change worked, or apply some adjustment like color correction to only the photos taken with a particular setting. (For example, lighten all the photos taken at ISO 100; apply warming filter to all photos taken with white balance "cloudy".) I'll take a throwaway photo of a consistent subject (the sky, the ground, my foot, etc.) to signal when I'm making a change like this in the camera settings. I hope you'll agree that signs aren't really such boring subjects after all!